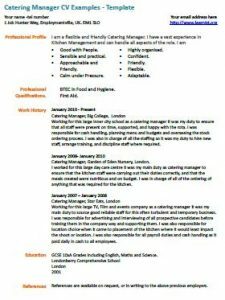 Catering Manager CV Examples – Template. Amend as suitable and use it to create your own CV in seconds to apply for job vacancies. Catering Manager vacancies can be found on the major job sites online including cv-library.co.uk, monster and etc. If you are required to write a cover letter for your job application then view our latest cover letter examples. If you have an interview coming soon then click here to view typical interview questions and answers. BTEC in Food and Hygiene. Working for this large inner city school as a catering manager it was my duty to ensure that all staff were present on time, supported, and happy with the rota. I was responsible for cash handling, planning menu and budgets and overseeing the stock ordering process. I was also in charge of all the staffing so it was my duty to hire new staff, arrange training, and discipline staff where required. Catering Manager, Garden of Eden Nursery, London. I worked for this large day care centre it was my main duty as catering manager to ensure that the kitchen staff were carrying out their duties correctly, and that the meals created were nutritious and on budget. I was in charge of all of the ordering of anything that was required for the kitchen. Working for this large TV, Film and events company as a catering manager it was my main duty to source good reliable staff for this often turbulent and temporary business. I was responsible for advertising and interviewing of all prospective candidates before training them in the company way and supporting them. I was also responsible for location choice when it came to placement of the kitchen where it would least impact the shoot or location. I was also responsible for all payroll duties and cash handling as it paid daily in cash to all employees. This CV templates cannot be published on any other site without prior permission however you are more than welcome to link to Learnist.org. More CV Examples can be found on https://www.learnist.org/category/cv-templates/.